by Dr Alexander Elder. I am starting with a review of this book simply because it is my favourite. Out of all the trading books that I have read, this is the one that I keep coming back to. 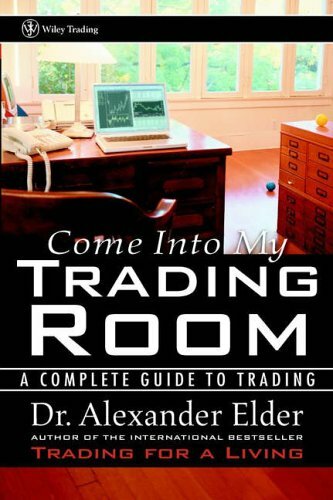 First published in 2002, Come into My Trading Room, is a classic of the trading genre. At just over 300 pages, the book is not particularly long, but it is packed with information. Unlike many other trading books, there is very little filler and repetition. In fact, the book needs to be read a number of times to fully absorb the contents. Despite the fact that the book is information dense it is not difficult to read. It is very well written and full of useful information and great stories. , he describes the moment when he jumped ship in the port of Abidjan, Ivory Coast. He was stationed on a Soviet Union ship and wanted to get to the US. Taking a huge risk, he left his ship and ran through the streets, being chased by his shipmates, finally reaching the US Embassy. He was eventually offered asylum and ended up in New York with $25 in his pocket. After settling in the US, Dr Elder became a psychiatrist. Later, he became interested in the financial markets as an individual investor. From this beginning, he has become one of the world’s best-known trading instructors. Dr Elder has an enjoyable and straightforward writing style. He quickly gets to the point but always makes it interesting. Despite his professional background, he does not dwell too much on the psychological elements of trading. He is dismissive of the people who believe that their psychological expertise qualifies them to train traders – unless they are also successful traders. Instead, Dr Elder emphasises the importance of mental qualities like not blaming others, trading in a calm state and having a mature attitude. What strikes me most about Dr Elder’s book is the honesty. Readers of this book are under no illusion that to become a profitable trader is a tough process. There are going to be costs in terms of time, money and mental effort. As well as being a trader we need to become our own analyst, advisor, back office and manager. He does not say the process is easy, but he does make it clear that if you do the right things and stay patient, you will be successful. This is a very positive message for traders just starting out. If I find my trading confidence slipping, this is the book I read to give me a boost and allow me to focus back on the markets. Dr Elder is a natural storyteller and is fond of using anecdotes and analogies to make his point. I like this; I find a story will stay with me long after I have forgotten a whole chapter of a textbook. One of my favourite anecdotes is the above paragraph that he uses to drive home the message that technical analysis does not need to be complicated. Dr Elder is generous with his recommendations. As he deals with subjects, he gives his advice on how to improve knowledge in specific areas. His ‘where do I go from here’ sections give readers a reading list of books to develop their analytical and trading skills. This section is for beginners, but even quite experienced traders will benefit from reading through. It provides a useful guide to different markets for traders. Inevitably parts of this section have been superseded by technological advances, but the underlying markets remain the same. This section deals with getting your head in the right place, technical analysis, trading and money management. In dealing with the head, technical analysis and trading, Dr Elder advocates a common sense and flexible approach. He recommends keeping technical analysis simple and only using a few indicators. Likewise, his trading advice is straightforward and does not delve into complicated strategies. In contrast, his approach to money management is rigid. He strongly suggests sticking to a maximum of 2% risk per trade. He also encourages traders to limit their maximum loss per month to 6%. 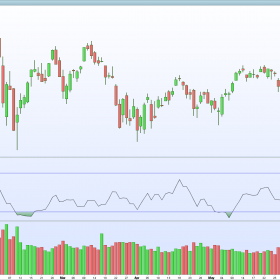 If your trading equity drops by this amount, then stop trading until the end of the month to give you time to recover your emotions and recheck your analysis. The final section of the book deals with being organised and managing time. Dr. Elder is strongly committed to traders keeping good records and trading from a definite plan. He also describes the process of going from beginner to semi-professional to professional. The above quote contains the essence of why everyone become interested in trading. The dream of leaving the rat race and having no boss. Dr Elder fully understands this dream, but he does not sugar-coat the fact that this can only be achieved through hard work and dedication. 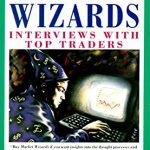 is the best all-round book on trading that I have read. It is an excellent introduction that provides a sound basis for anyone interested in learning how to trade well. If you have any thoughts about this review or about the book please feel free to comment below. Also please leave any comments about other good trading books. This entry was posted in Essential Traders Library, Trading Book Reviews and tagged Alexander Elder, Traders Library, Trading Room.